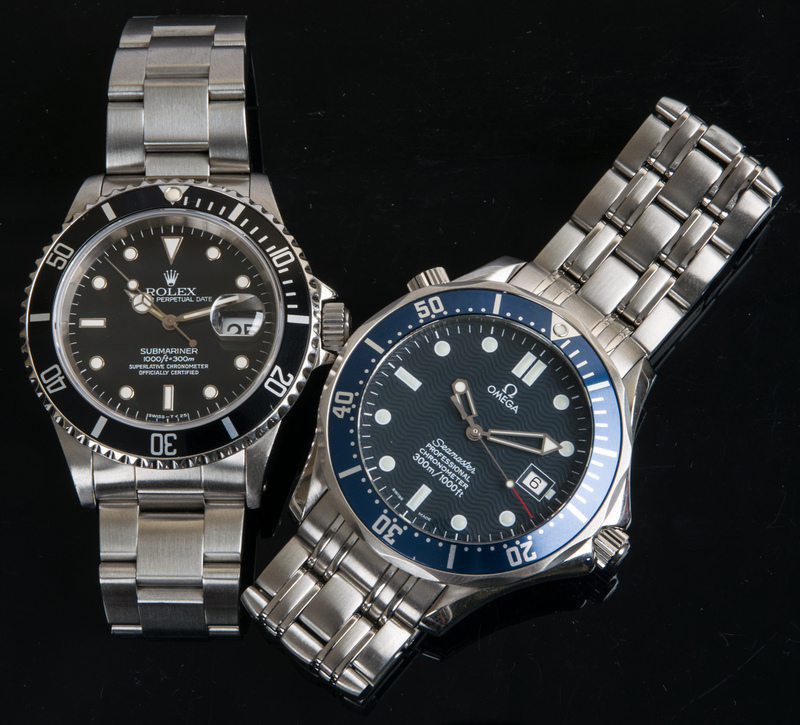 I am frequently asked “Which watch is better, an Omega Seamaster or a Rolex Submariner?” and the answer is difficult and complex unless the inquirer is very clear about which models of the two watches they are comparing and what they want to get out of the watch. 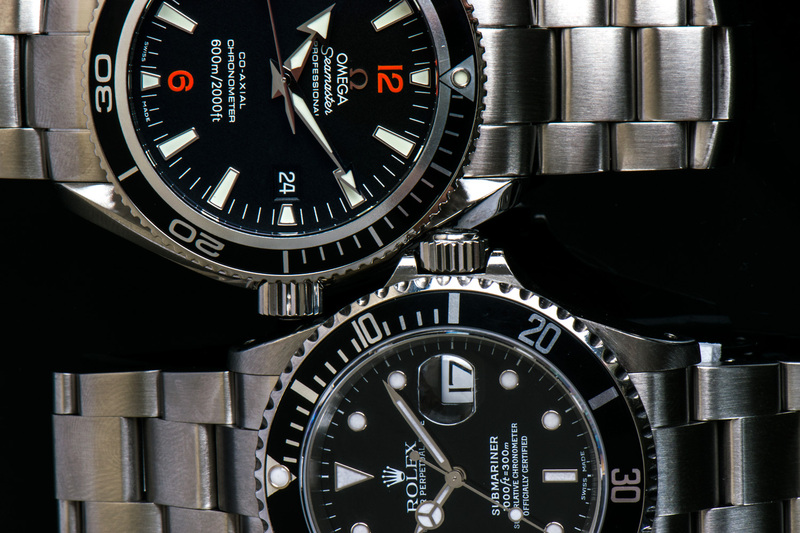 The first step to finding the answer is to realize is that all Submariners are not the same and all Seamasters are not the same. There are different grades of both watches depending on the model and when they were produced. With the Submariner, we’ll compare three versions. 1)The current “SubC” 116610, 2)the post-2000 16610s and 3) the pre-2000 16610s. 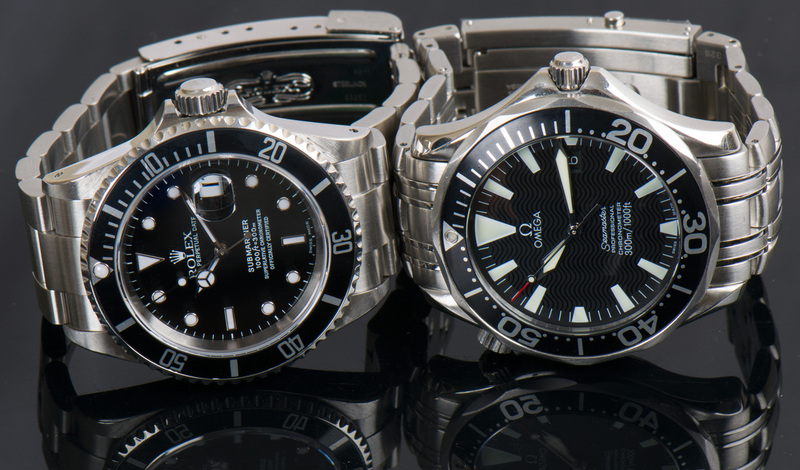 With the Seamaster, we’ll compare the Seamaster Professional 1) pre-coaxial from the late 90s, early 2000s, 2) the current Seamaster Diver (Professional), 3) the early Seamaster Planet Ocean and 4) the current Planet Ocean. The next step to finding the answer is to consider which attributes to compare and which to ignore. The question that I think is really being asked is which watch is the better overall value and to determine the answer I’ll look at the following. The most well-known of these Seamasters would be the 2531.80 model (the iconic Bond Seamaster) and the 2254.50 model (the so-called Peter Blake model). 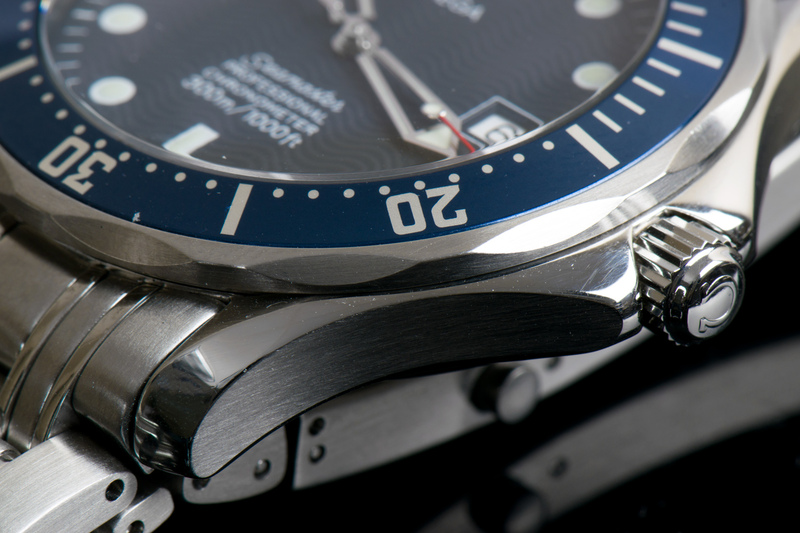 There are many other Seamaster incarnations, in titanium, electric blue, America’s Cup, mid-sizes, quartz, etc. If we were judging variety, this would be a win for Omega. 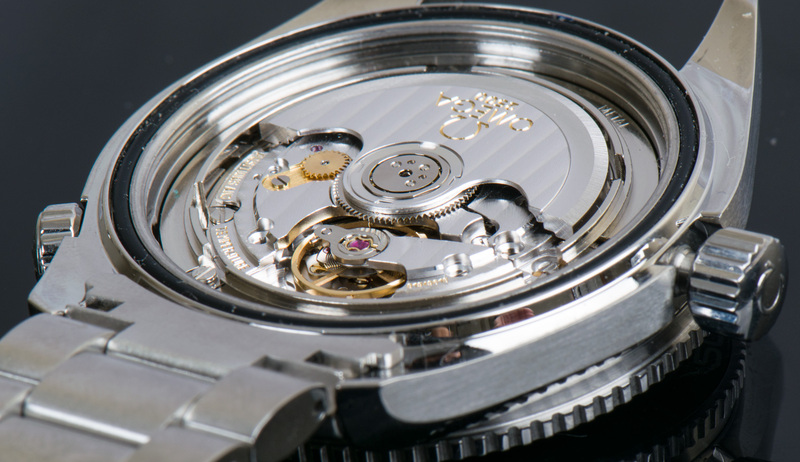 These Seamasters use the venerable ETA 2892-A2 caliber (Omega 1120) , a widely distributed movement. 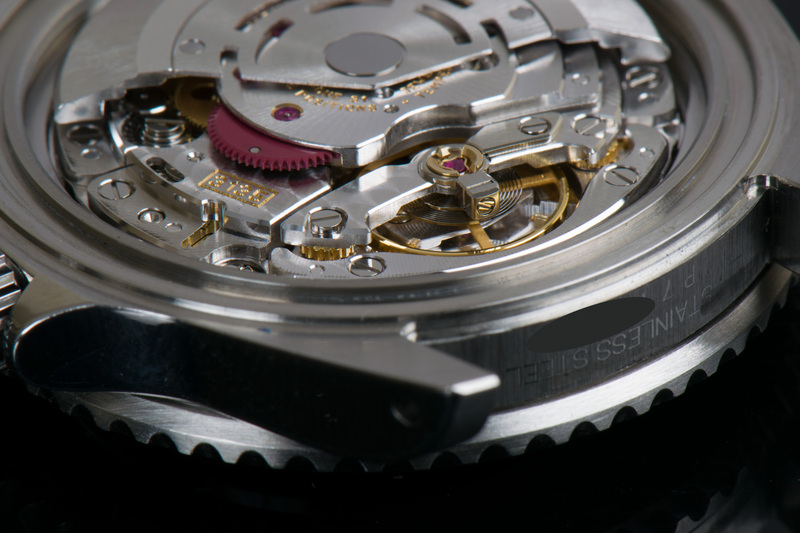 Many aficionados consider this movement as ‘lesser’ than the Rolex 3135 caliber. While I agree, I think the margin of disparity between the two is thinner that most people assume. The ETA 2892 comes in multiple grades, but a Chronometer grade ETA 2892 such as used in the Seamaster Professional can go head to head with the Rolex 3135 caliber in most comparisons. 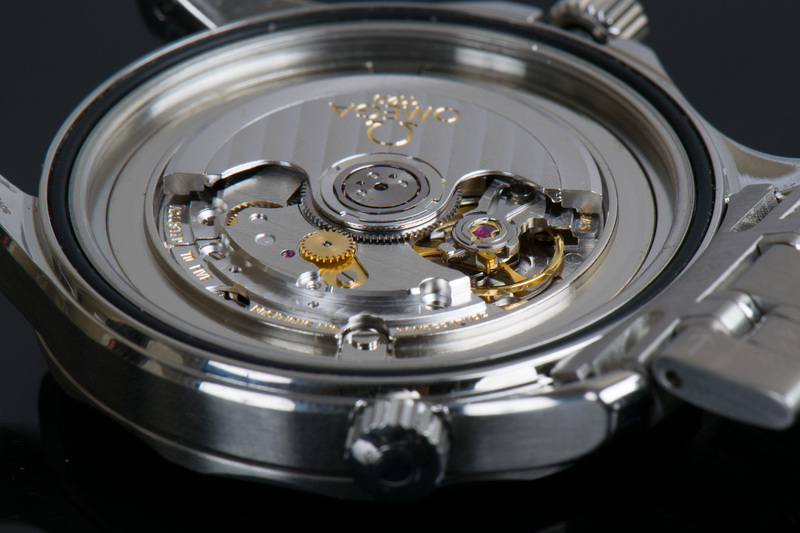 For more reading on the 2892 I suggest this article by chronometrie. Considering the known longevity of Rolex calibers and my own anecdotal experience with these calibers, I will give Rolex the win in this category. I do find the Submariner bezels easier to use because of the better grip, it is easy to slip while turning the Seamaster bezel. Otherwise, the quality of the anodized aluminum bezel inserts on these models are pretty much a draw. Anodized aluminum will scratch and fade with time. Rolex bezel inserts are actually easier to have replaced at about $200. Omega Seamaster bezels have to be replaced complete for about $300. There are quality aftermarkets for both that can be had for about $50. The luminous from a Seamaster Professional model 2254.50 (far right below) will beat the pants off the luminous from a post 2000s Submariner (and indeed most other watches). This has made the 2254.50 and other ‘sword-hands’ Seamasters the most desirable of the Seamasters. Seamaster Professional models with skeleton hands are roughly equal in the dark as a post 2000 Submariner. 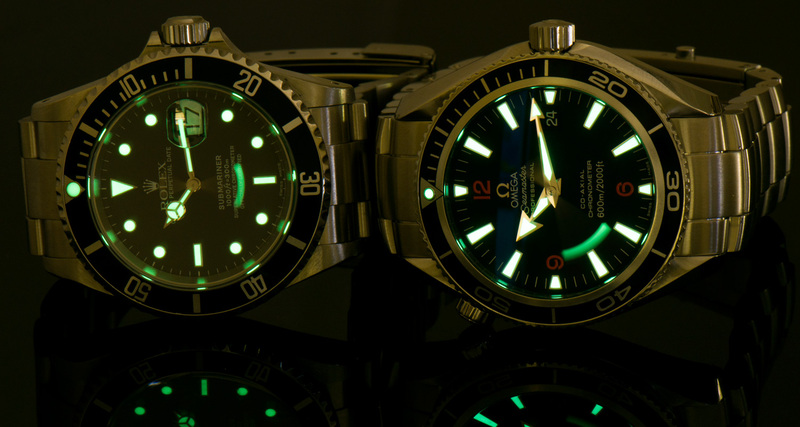 Unfortunately for the Submariner, pre-2000s (far left below) it doesn’t even have a chance to compete since the tritium lume will be dead by now, unless the dial and hands have been replaced. The bracelet quality of late 90s early 2000s Seamasters is far better than the quality of the non-SEL (Solid End Link) bracelet found on pre-2000s Submariners. Beyond just the poor initial wrist feel of hollow end links and hollow center links, and a flat diver’s extension, the non-SEL bracelets tend to stretch after years. A late 90s, early 2000s Seamaster bracelet will usually still have a good fit and feel if the watch wasn’t abused. Even a new non-sel bracelet had a very tinny wrist feel. 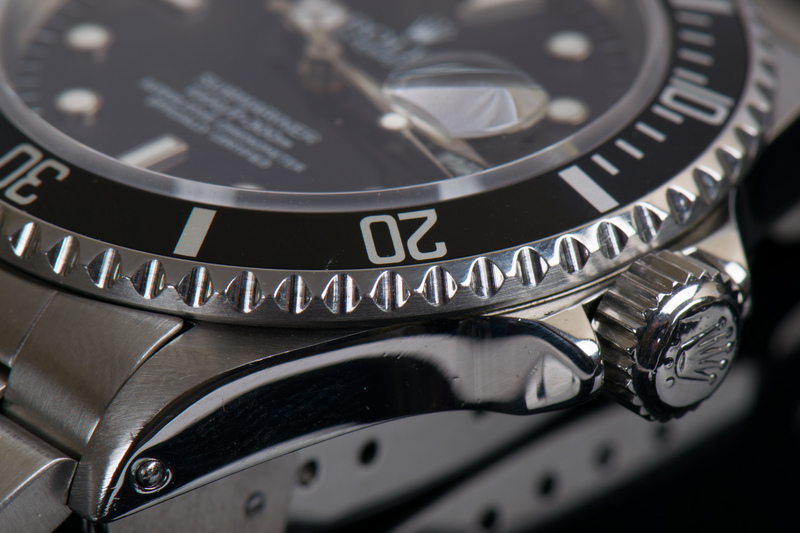 The SEL bracelet on the post 2000s 16610 was a good start for Rolex and although it can still stretch through the hollow center links, the solid end link and improved diver extension provides a good solid feel. As a side note, if you wanted to replace an older worn 90s bracelet, a complete new Seamaster bracelet can be had for around $600, versus a Submariner bracelet at $1250. The resale value as of writing is $2,000-$3,000 for a preowned Seamaster from the late 90s early 2000s with some variations being more desirable than others. The Seamaster Professional retailed at $1750 in 2004. A Submariner which retailed for $3350 in 1996 sells today for $4000-5000 depending on condition. A Submariner which retailed for $4250 in 2004, now resells for close to $6,000. The winner here is the 16610, but surprisingly only the post 2000’s 16610. Factoring in the cost of two services for the Seamaster and assuming the most desirable model was purchased, the Seamaster owner just about ‘breaks even’. The Submariner from 1996 would have needed at least three services during that period, and the owner would likely be more invested in the watch than the residual value. The person who bought their Submariner in 2004 is looking quite happy with their investment. A Submariner owner who bought their watch in 2008 at the final retail of $6000, might not be so happy, but will have broken even on a very short investment. Given the rise in resale value of the late 90s early 2000s Seamasters, it is easy to recommend one as a solid alternative to a Submariner from before 2000. A post 2000s 16610 with SEL would be a better long term choice. If you’re saving up for a Submariner, you could easily reason that it might be a good decision to treat yourself to a Seamaster today and trade in for a post 2000s Sub later. The Planet Ocean bezel may be marginally more grippy than the Submariner, but it is really too close to call. The luminous of the Planet Ocean is easily brighter than a post 2000 Submariner 16610. 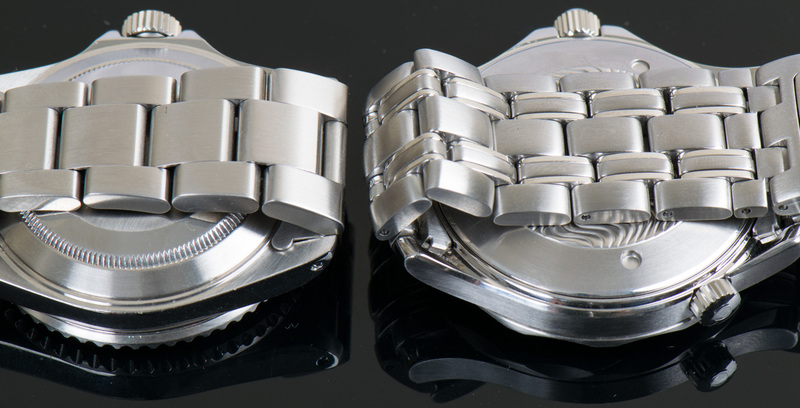 The bracelet build is at roughly the same quality of the earlier Seamasters, which makes this a win for Omega. The only drawback for Omega is the lack of micro-adjustment in the buckle, the half links of the bracelet are not quite as small as those on the Professional models making a perfect fit a little harder to achieve. Today you can pick up a preowned Planet Ocean in the neighborhood of $3500 and there are some new ones still out there at the retail of $4,500. The resale value of this model has remained strong since it was introduced, but while it has been steady, it hasn’t approached the resale value of the Submariner. If you bought the Planet Ocean new in 2008, the retail was still $4,500, so you can expect to take a loss. Again the Submariner purchased new in 2008 at the height of its retail, is worth about what was paid for it. 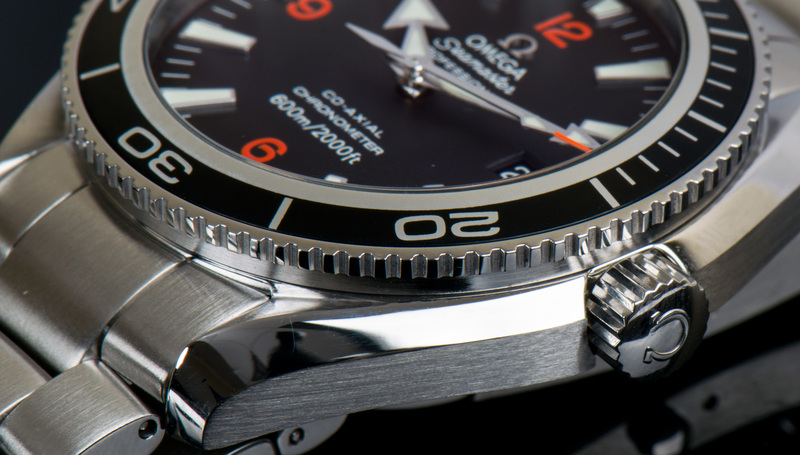 Again it is very easy to recommend the Omega due to the inherent quality, and who knows what we’ll see out of the resale value in the future from this brand and that’s really the only sticking point. For a price difference of $2500 between the two, I think this is a bet worth taking on the Omega. The Omega Seamaster with ceramic bezel vs the Submariner (16610) pre and post 2000.